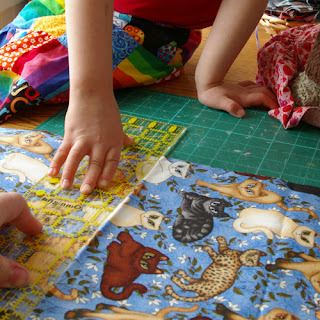 Enough that I remember the machine being present in our home, and the wonder of opening the wicker sewing basket, with bright green lining, and admiring the rows of pins and the colourful threads inside (and pricking my fingers!). And the Campbell's Soup label patterned shirt she made me, and the khaki coloured full circle skirt I chose as a pre-teen. And the mending, and occasional curtain. I expected to learn to sew. It just seemed like something that women knew how to do. Like laundry, makeup or cooking. At 16 my mother promised me her old Singer, which she planned to refurbish. 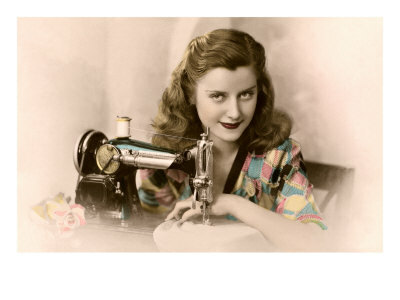 Life happened, and at age 22, when I heard her promise my much younger sister the sewing machine, I leapt to claim it. And taught myself to sew. But baby, I can sew. And today Rowan had her first sewing lesson (age 5.5). While the rotary cutter remained in my hand, she was eager to handle pins, snips and ruler (and sewing makes for great lessons in math and measurement! ), and of course, to 'drive' the machine. We chose a fabric I have had stashed for years~ I could never find quite the right project~ a decided on that simplest of projects, a pillowcase (cut 22 x 38" for those interested). While we did some basic terminology~ selvage, right and wrong sides~ Rowan enjoyed the coloured dots that identify the screens/ colours in the fabric and played a game of match-the-dots. We explored the one inch squares and practiced lining up our ruler in various ways. With our fabric cut, it was time to pin~ a perfect fine motor task for little hands... both precision and care are required! When we were all pinned up, we did a basic overview of the sewing machine: bobbin, thread, reverse, pedal, feed dogs (*giggles ensued*?!) and stitch patterns. Winding the bobbin was a big hit, as it allowed Rowan to drive the machine (foot pedal) without too much concern for speed or accuracy! For the actual sewing of seams we alternated between Rowan working to guide the fabric (another little measurement chart!) 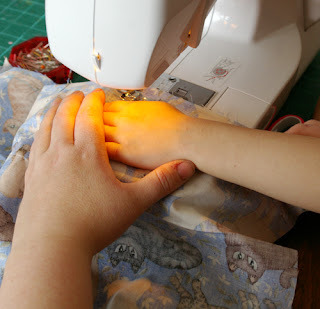 with her hands and using the foot pedal, as the two together were a little too complicated for straight seaming. 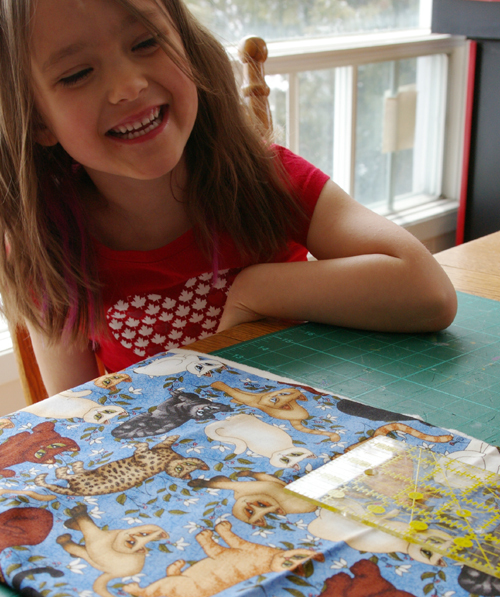 I do plan to set her loose on some paper with a threadless needle one of these days to learn about speed and control. 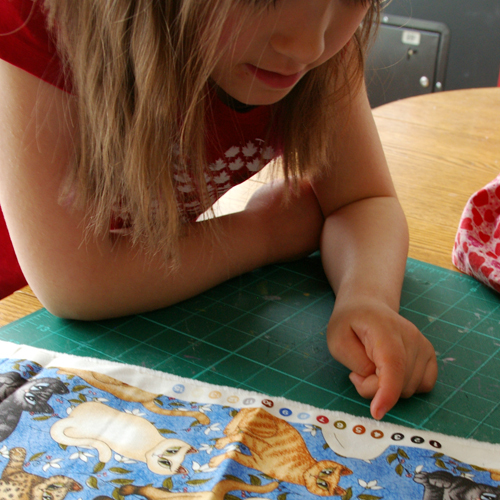 Once the side seams were done and trimmed, Rowan marvelled at how she had put the pieces together and chose a decorative stitch to finish the opening. Once I had pressed our hem (the iron also being on the 'not yet' list! ), we finished the case, Rowan used the thread snips to clean up our seams. A perfect fit and a very proud little girl! We both enjoyed our first lesson... I am looking forward to more, especially to the possibilities that unfold when I can offer this creative little soul the skills and tools to express her ideas! 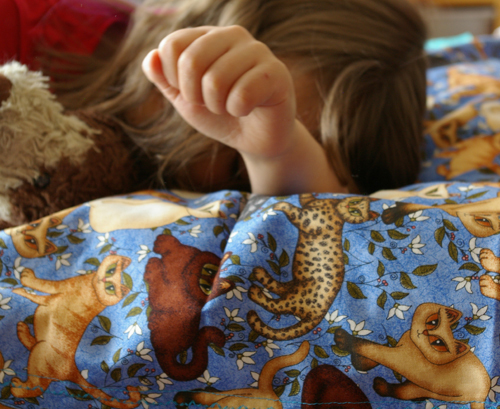 Cute pillowcase! We have done lots of handsewing here at our house. Felt is the fabric of choice -- so easy and forgiving. Having her own sewing basket is wonderful. 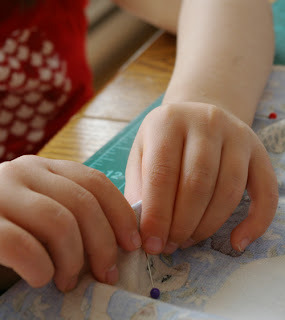 (felt, thread, needles, scissors, patterns) She has freedom to sew whatever she wants and then knows how to put it all away when she is done, so it is ready for the next project. 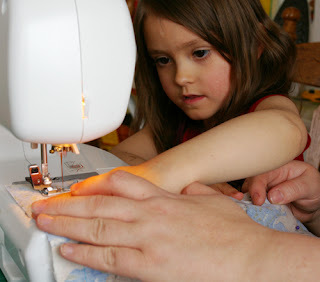 maybe it's my pregnancy hormones, but this post makes me all teary eyed with memories of my beloved grama and my mom teaching me to sew (er, trying to) when i was young. 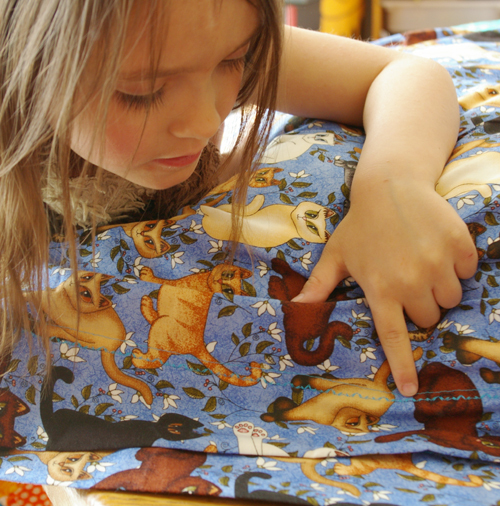 the photos of sweet little rowan's hand and your hand guiding the fabric is just so very beautiful. what a great post! LOL "but baby I can sew!" I can cook and i rarely wear make-up, but sewing is not one of my fortes! 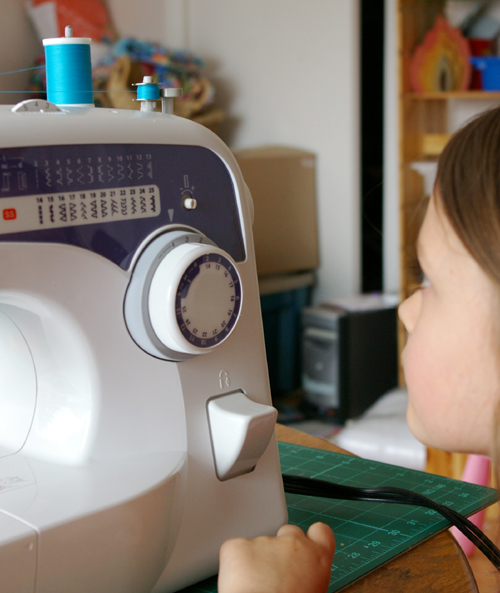 We haven't had a sewing lesson yet...but my 4 year old son loves to watch me any time I use my machine. Maybe a lesson is in order soon. Thanks for inspiring me!